Before I get into talking about the Machamp deck that I have built that has proven to be one of my favorite decks in the Standard format I want to talk more generally about a deck construction combo that I think will see a lot of play during the City Championship format in a variety of forms throughout the tournament series. That combo is Smeargle from BREAKthrough with Bronzong from Phantom Forces. I was super excited to see them make another good Smeargle card in BREAKthrough, in fact I think it is one of the best cards in the set. 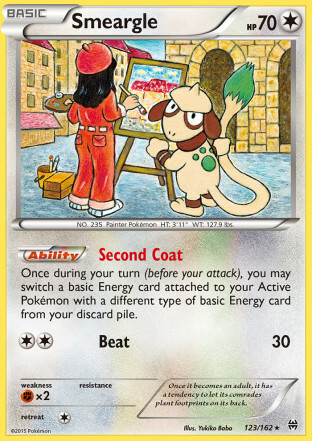 Smeargle has the Ability Second Coat which lets you switch a Basic Energy card attached to your Active Pokemon with a Basic Energy card from your discard pile. This ability is groundBREAKing and will allow for many new type combinations to be played allowing for a lot of creativity in deck building. 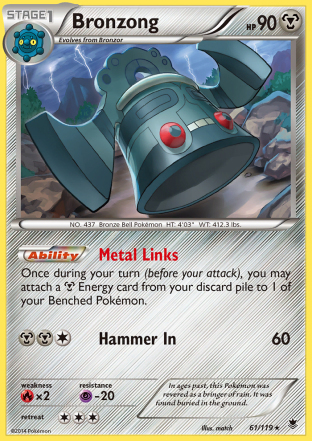 This combo uses Bronzong to accelerate Metal Energy to your benched Pokemon, and then when you have your Pokemon active with all this Metal Energy you can then use Second Coat to swap it out for the Energy types needed to fulfill your desired Pokemon’s attack costs. I have taken this Smeargle/Bronzong combo and have combined it with an older concept, Machamp EX/Ariados AOR, which had difficulty getting Energy onto the field, to give the deck a much stronger punch than it previously had. 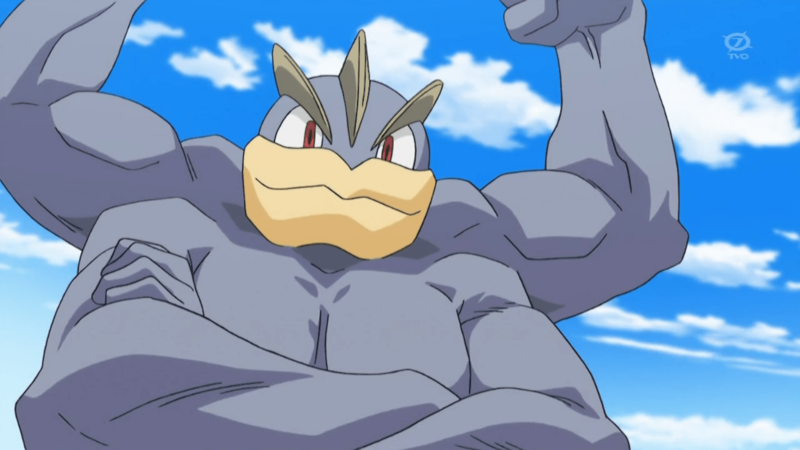 As mentioned in the introduction, Machamp EX is the primary attacker in the deck. 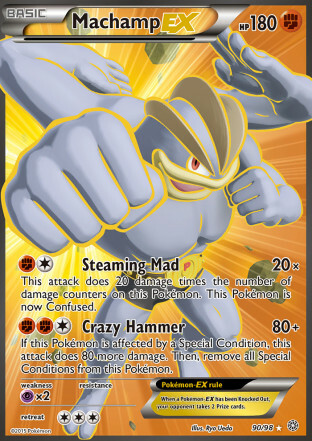 The main attack that you use with Machamp EX to force the action in the game is its Crazy Hammer attack, which costs [F][F][C], and does 80 damage plus 80 more damage if Machamp EX is affected by a Special Condition. Then you remove all Special Conditions from Machamp EX. You use Ariados to Poison both your own Machamp EX as well as the your opponent’s Active Pokemon, allowing Machamp EX to do 170 damage with the Poison damage added in. One of the great things about Machamp EX is that it has a great secondary attack with Steaming Mad, which is essentially a super strong Outrage attack. Machamp isn’t just outraged, he is steaming mad! For [F][C], Machamp EX does 20 damage times the number of damage counters on it, and then it confuses itself. Steaming Mad can make Machamp very awkward to deal with, as anything that relies on 2HKO’s or 3HKO’s is opening itself for some very powerful attacks hitting back at them. The attack is also somewhat awkward for you to use, as Machamp does confuse itself, but that is generally okay as your Machamp EX will have lots of damage counters on it, so it’s usually going to get knocked out on the next turn anyhow, and if it’s not, you can possibly Switch and retreat back into it, or retreat to another attacker. Beyond boosting Crazy Hammer’s damage output, Ariados also is able to play a niche meta game specific purpose with its Poisonous Nest Ability. Decks that rely on Focus Sash to prevent OHKO’s, such as Mienshao and Lucario EX/Crobat PHF, have popped up in the Standard format in some significant numbers and the poison damage allows you to work around Focus Sash to still take OHKO’s. As far as secondary attackers go, I added Lucario EX and Regirock to complement Machamp EX. 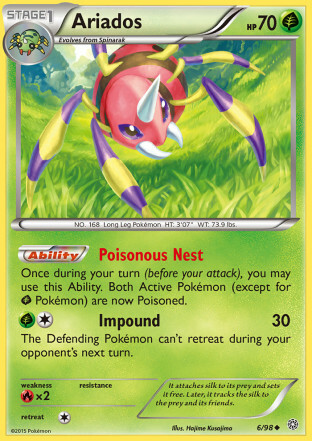 I found that sometimes I was falling a turn behind Night March decks just because there is quite a bit of setup involved with this deck, so I wanted something that could more quickly be sent out to knock out a Joltik or Combee to keep pressure going on Night March as you work to setup more attackers. I chose Regirock over Hawlucha FFI because Regirock not only has uses against EX Pokemon but can also be used to trade with non-EX Pokemon such as the Night Marchers. As mentioned earlier, the deck uses the Smeargle/Bronzong combination for Energy acceleration. With these two helping out it’s very easy to power up a turn 2 Crazy Hammer. This combo is very self explanatory, so I will leave it at that, but one thing to point out about Bronzong is that you can use it as an attacker against Regice, as it will OHKO any Regice because it can hit them for weakness. As far as the draw engine is concerned, I went with 4 Professor Sycamore, 2 Professor Birch’s Observations, 1 Judge, 1 AZ, 4 VS Seeker, 2 Shaymin EX, and 4 Acro Bike. I haven’t really been too in love with the Supporter options available in this format so I tried out Acro Bike to give the deck some extra draw while not committing to any subpar Supporter cards and it has been working out pretty well for me in testing this deck. One of the nice things about Machamp EX opposed to an attacker like Tyrantrum EX is that it doesn’t discard any Energy when it attacks so you don’t have to constantly be hitting Switching mechanisms to keep re-powering Machamp’s to attack. Because of this you usually won’t miss any attacks once you get setup and this also allows you to commit less resources in the deck to switching cards. In this deck I went with 2 Float Stone, 2 Switch, and 1 AZ for switching cards. 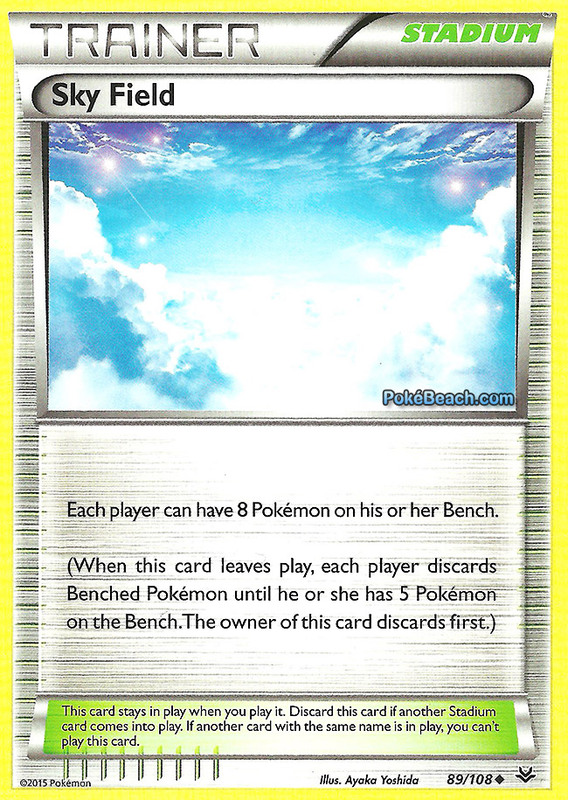 The deck does have a lot of parts that need to be benched so the deck uses Sky Field to allow it to setup a bench with all of its support Pokemon as well as keep room for the Shaymin EX’s that you use to get extra draw to get everything setup in the first place. I really would like to find room for a secondary Stadium in the deck to bounce Sky Field so I can discard my Shaymin EX’s and eliminate those liabilities from the field but I haven’t quite found anything I want to cut yet. The easiest cut is probably to just get rid of the single Level Ball in the deck. If I were to add a third Stadium I would put in either Fighting Stadium or a Faded Town. I think most likely I would want the Faded Town, as a Strong Energy can already allow Machamp EX to OHKO any non-Mega EX and Faded Town can hit more than just the active and can accrue additional damage if your opponent can’t immediately respond to it with a counter Stadium. 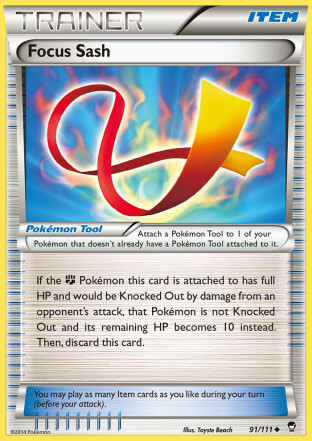 Lastly, as the deck plays Fighting types as its attackers it is able to take advantage of some of the strong Fighting support that Pokemon has given us – Strong Energy and Focus Sash. The deck plays four Strong Energy to add extra damage to Machamp EX’s (as well as Regirock’s and Lucario EX’s) attacks. Focus Sash is also really important to giving the deck some extra strength. If your opponent can’t remove the Focus Sash then Pokemon such as Vespiquen, the Night Marchers, and M Rayquaza EX will be unable to OHKO your Machamp EX. When you’re OHKO’ing your opponent and they cant OHKO you back a strong deck you have. Machamp EX/Ariados AOR has been one of the most successful decks for me in my early testing of the XY-BKT format. On the surface the combination is obviously strong as you are able to take OHKO’s, have a powerful Outrage style attack, and are also able to deny OHKO’s on your own Pokemon with Focus Sash. I was a bit skeptical of whether this deck would actually work just because there are a lot of Support Pokemon that need to be benched and setup, three in total with Ariados, Bronzong, and Smeargle. After figuring out the right engine to get everything going I am confident that this deck sets up often enough to find success at the upcoming City Championships. I haven’t tested the deck in Expanded yet, but I think it has some potential to do well in that format as well as it can take advantage of more powerful Supporter cards. Colress will allow the deck to draw more cards and setup faster and more consistently. Additionally, N can be super powerful when paired with a OHKO attack that doesn’t discard Energy and a Pokemon with Focus Sash attached to it. The deck does have some issues with Item lock, so if you expect Seismitoad EX decks to be prevalent in your meta game I would make room to fit in one or two of the new Jirachi promo that discards Special Energy and then prevents all effects of attacks, including damage done to it on your opponent’s next turn if it discarded an Energy with Stardust. Overall I’m really happy with how this deck performs and will definitely be keeping it in my rotation of decks that I will have ready for Standard City Championships.